Orlando, Fla. – June 5, 2018 – The nine winners of the International Parking Institute’s (IPI) 2018 Awards of Excellence prove that when ever-expanding technology and creativity are applied to daunting architectural and parking challenges, the results can be extraordinary. 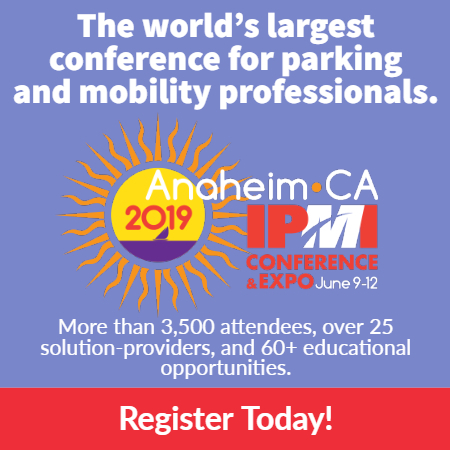 Their diverse parking and mobility solutions support the environment, enhance a luxury shopping experience, offer a history lesson, evoke art and natural beauty, transport hospital patients quickly and efficiently, and improve the lives of college students. 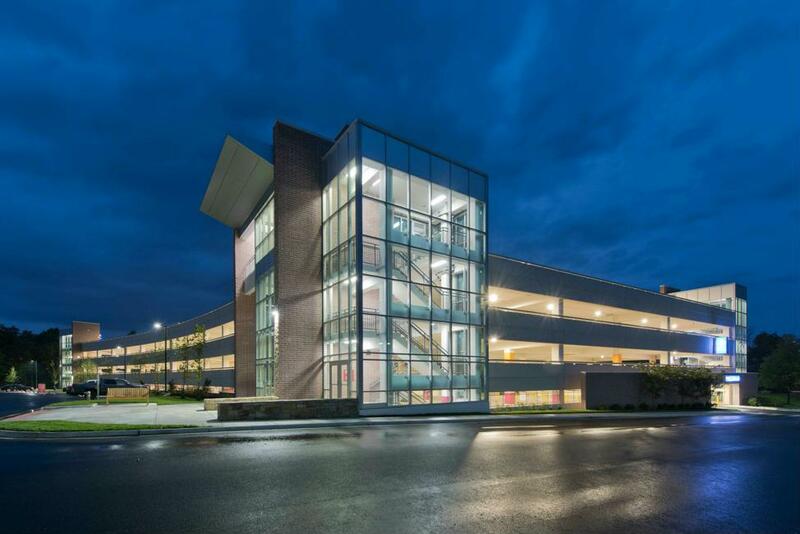 Selected by a judging panel of architects; parking experts; and city, airport, and university officials, winners will receive honors at the 2018 IPI Conference & Expo, June 3-6 in Orlando, Fla.
Leesburg, Va., a suburb of Washington, D.C. Parking Consultant: Walker Consultants, Philadelphia, Pa. 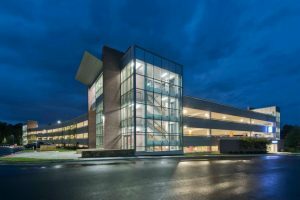 Located in Leesburg, Va., Inova Loudon Hospital’s new parking garage for patients, visitors, and staff looks like it has always been there, which is what the hospital was aiming for. The 765-stall structure was designed to be both easy to navigate and integrate with existing traffic patterns. Emergency-room visitors park on the ground level; visitors to other areas are directed to higher tiers; and staff are assigned spaces in a specific area. 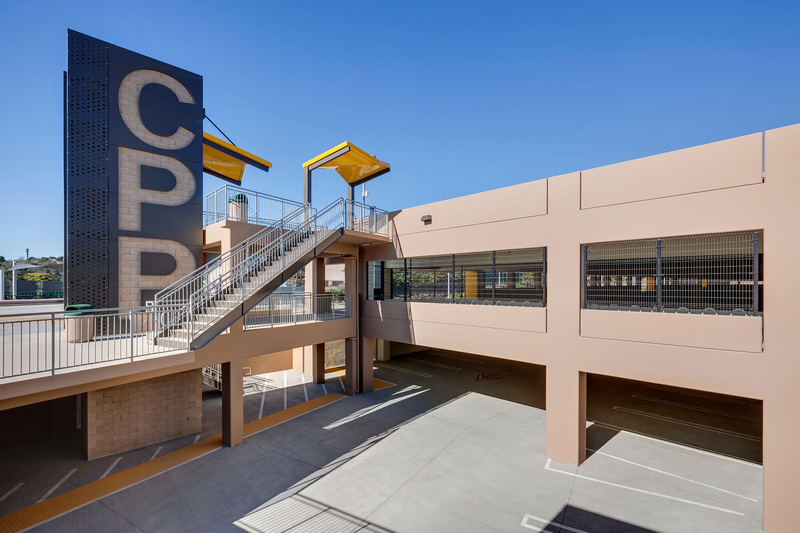 Clear sightlines to elevators and stairwells (open to the inside of the garage) provide easier wayfinding and greater security while a two-way vehicular ramp offers passive security and convenience. The cast-in-place structure was designed for minimal maintenance, with best-practice construction and design materials. 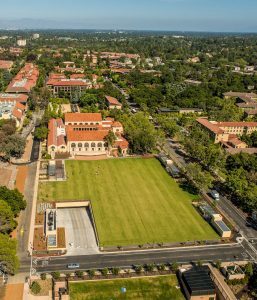 Parking Consultant: Watry Design, San Jose, Calif.
As Stanford University in Stanford, Calif., continues to densify to meet the needs of a growing student base, preserving green space is a top priority. 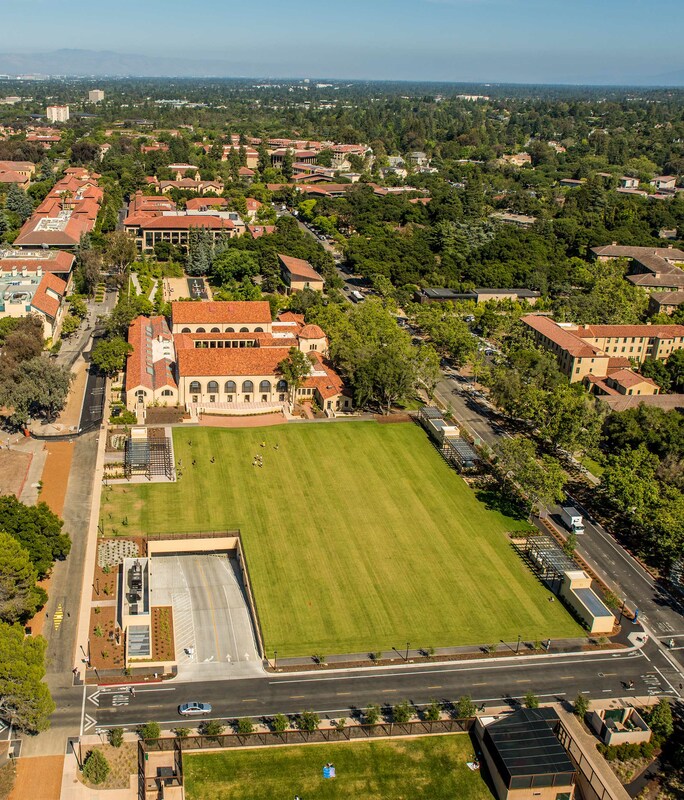 Its new parking structure enabled the university to meet current parking demand and provide some cushion while preserving Roble Field, an open grass space for students to gather, relax, and enjoy recreational sports. The 1,162-stall, five-level, below-grade structure provides 52 electric vehicle (EV) charging stations on level P1. In anticipation of future demand, levels P2 through P5 are prepped for 84 more EV car-charging stations. Watry Design is assisting the university work toward Parksmart Silver Certification for the structure, which also embraces mobility, providing pedestrian and bicycle access to a shuttle stop, Panama Mall, Samuel Morris Way, and Governors Corner, as well as bicycle parking. To minimize cracks and future maintenance, perimeter basement wall slabs were given 45 days to shrink before walls were locked into place. 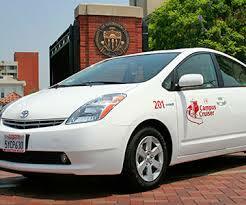 The garage serves resident students and visitors, who use walk-up pay stations. Infrastructure for future parking control gates was incorporated into the design. Three brightly painted elevator cores facilitate movement and wayfinding, and LED fixtures with occupancy sensors offer illumination with minimal energy use. The structure’s roof houses Roble Field, a recreational playing field, and painted trellises blend pedestrian areas with the natural environment. 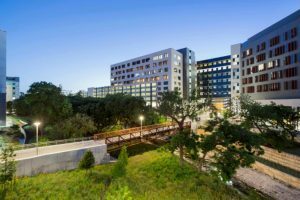 The University of Texas at Austin’s new Dell Medical School aims to improve community-based healthcare, and the new, six-story, 1,120-stall garage serving its outpatient-care-based Health Transformation Building was designed to enhance that mission. With Waller Creek forming its eastern border and an oak-tree grove to the south, the site fell within 100- and 500-year flood plains; its structure shape and height were dictated by Capitol View Corridor restrictions that ensured visibility of Austin’s Capitol dome. The garage’s cast-in-place concrete, post-tensioning ensured durability and a space average of 376 square-feet. Careful detailing and waterproofing of a split slab on the second level maximizes street frontage for retail and mercantile tenant spaces. 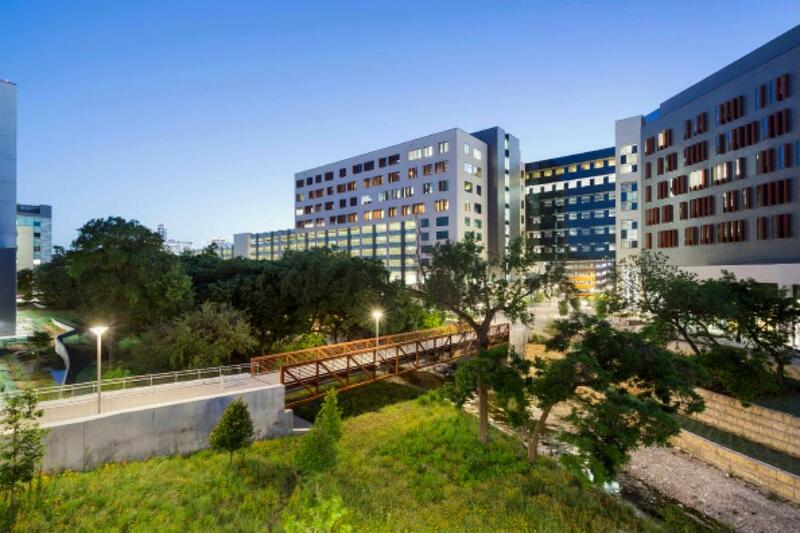 The level-one ambulatory surgery center faces Waller Creek and is serviced from the garage’s shared loading dock. Its critical-care functions necessitated vibration and sound isolation from the garage superstructure. The ground-level café tucked into the northeast corner provides food service to the Health Transformation Building as well as the adjacent Health Discovery Building, with outdoor seating available in the plaza between the buildings with a view of Walter Creek. Levels 2 through 6 house reading and conference rooms and a creek-view terrace. Integrated lobbies on each level feature large wayfinding elements, level-reminder business cards, and other navigation aids. Non-transient staff and medical physicians access reserved parking areas on level four. A speed ramp to the second level allows for direct patient drop-off, with integrated bypass lane and turn-around for mistaken drivers. Level 2 has 55 motorcycle permit spaces and accommodates emergency ambulances equipped with CO2 sensors and idling fans. Street-level bike parking offers six shower and changing facilities. 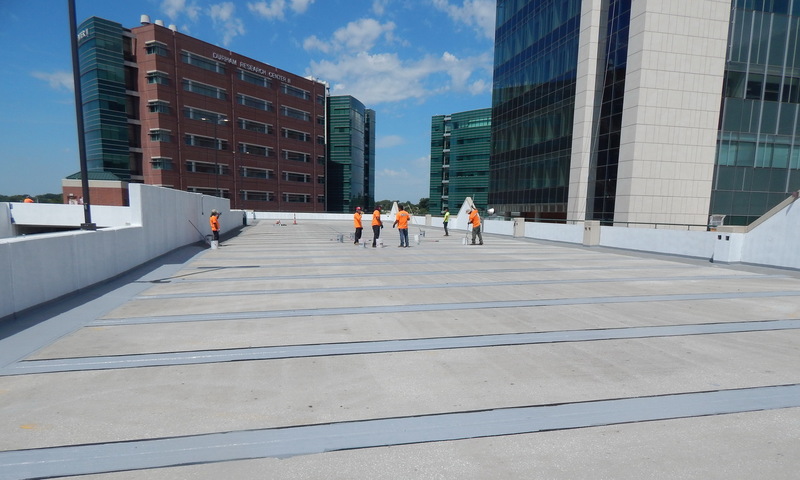 The larger project is LEED (Leadership in Energy and Environmental Design)-gold certified and includes many sustainable features, such as a 22,000-square-foot green roof and rainwater capture/recycling system, which feeds a 27,000-gallon cistern visible on two levels. 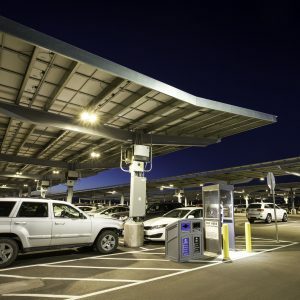 Denver International Airport’s newest 800-space surface lot provides convenient, covered parking and a much, much more – including a solar-canopy microsystem covering 609 of the spaces, and a battery demonstration project (owned by Xcel Energy in partnership with Panasonic) will examine how a battery system can help integration of renewable energy, reliability of the distribution system, voltage management, and peak reduction. The lot is a platform to test new technology that promotes sustainable growth and innovation. The site’s solar panels feed energy to an onsite battery storage system, which currently helps power an adjacent office building and will serve new development. Located at the 61st and Pena Regional Transportation District University of Colorado A Line station, the lot offers daily, overnight, and monthly parking options for commuters taking the rail train to the airport or downtown Denver. An autonomous vehicle transports passengers between a nearby bus station and the train station. The unstaffed facility offers eight pay stations and is checked three times daily. Drivers can access free services that include vehicle location, jump starts, tire inflation, and lockout help. The structure features free Wi-Fi and 11 level-1 EV charging stations for patrons. A new mixed-use development is planned nearby. Partnering with an outside agency immediately solved numerous internal operational challenges, including vehicle inventory and expenses, staffing, and office space. Lyft drivers are independent contractors, providing service in their own vehicles, and requiring no office space. At the beginning of each semester, currently enrolled students receive specific directions on how to register for the program; once signed up, they can download an app for the Safe Rides program. If their ride meets program restrictions (starting and ending within the Campus Cruiser boundaries and observing the time frames of the program), USC pays for their ride. 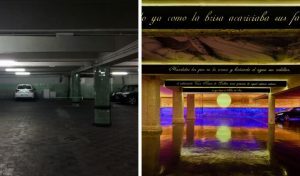 Parking Consultant: Walker Consultants, Tampa, Fla.
Renovating this two-story garage in an affluent, city-center neighborhood in Madrid, Spain, started with three goals: making the parking more attractive to potential clients, reducing maintenance costs, and minimizing the effect of construction on operations. The key was smart design based on three main strategies: using light as a design element, unveiling the existing building instead of covering it, and developing previously held workshop mock-ups to reduce construction time. 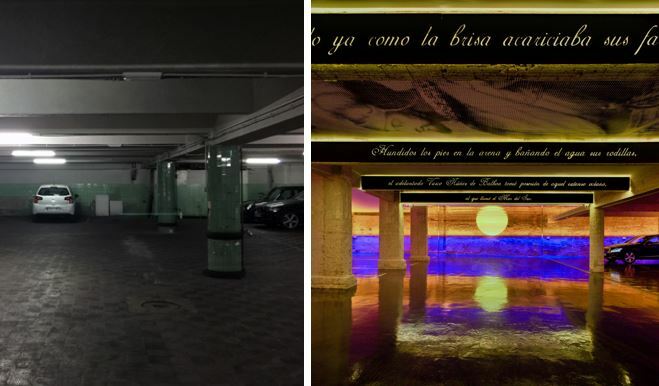 The garage’s new design was inspired by Spanish explorer Vasco Nuñez de Balboa. The entry is a tunnel of repetitive white light arches over a black wall. Main level walls were stripped of their old tiles and restored to their original brick, while orange and blue lighting simulate a horizon line of sea and sun. A mirrored in the main corridor generates an illusion of a complete sun with a simple, semicircular lamp. Large beams narrate the explorer’s discovery in narrative, and the ceiling displays portraits of de Balboa that become clearer as drivers park, letting them make their own discovery. Almost all design features started with cost-effective, low-maintenance LED lighting, which won a Lamp Lighting Award. PARCS technology was updated. Construction was completed during summer, when demand is lowest. The popular, financially successful garage nets revenues up 50 percent since the renovation. The new, 1,800-space Parking Structure 2 was designed and built in keeping with California State Polytechnic University in Pomona’s (Cal Poly Pomona) long history of promoting sustainable practices and environmental awareness. 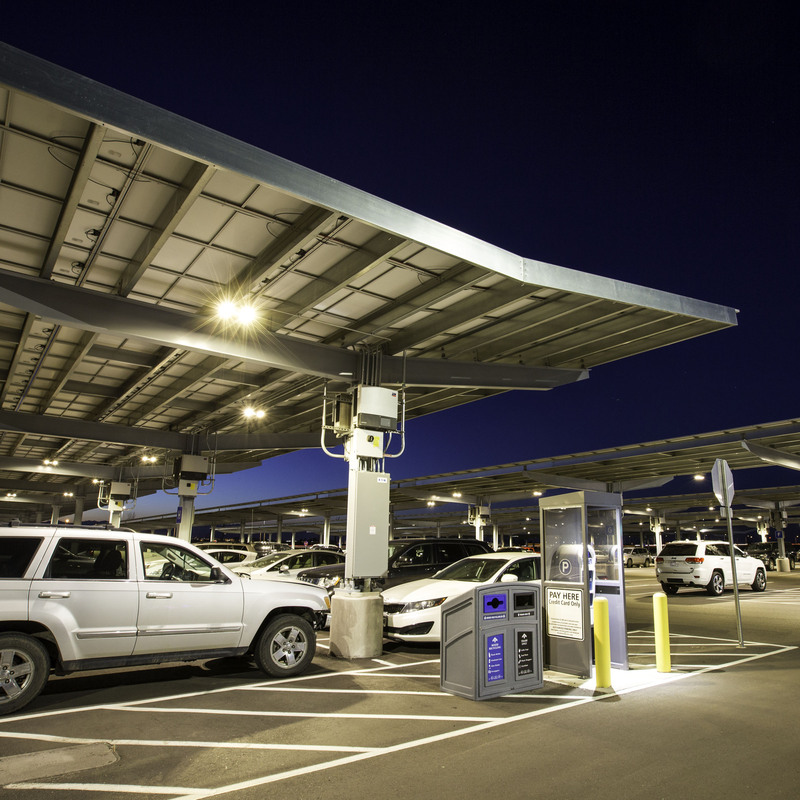 The bronze-level Parksmart Certified structure features several sustainable factors, including solar panels on the top level, a naturally ventilated lower (below-ground) level, 24 EV charging stations, bicycle storage rooms, dimmable LED lighting, drought-tolerant landscaping, and a state-of-the-art rainwater collection system. When considering factors to achieve Parksmart certification, university project managers ensured that labor and materials were sourced locally and that recycled content was maximized. The structure is designed to harmonize with its surroundings and reflect the university’s commitment to the environment. Architect/Engineering/Parking Consultant: TimHaahs, Miami, Fla.
Sawgrass Mills in Sunrise, Fla., is a luxury outlet shopping destination that serves tens of thousands of annual visitors. The relaxed, open-air promenade features more than 350 retail, dining, and entertainment venues, including 70 luxury stores. The Simon Property Group hired TimHaahs to develop a new, 1,723-space parking facility that would complement and enhance visitors’ experience in the shopping center. 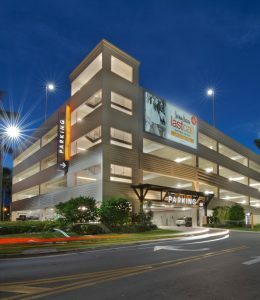 The garage’s large, multi-level valet parking operation features a fully furnished, ground-level waiting area that creates an inviting front-door experience for shoppers. Its lightly sandblasted, sandy-yellow exterior matches the center’s stucco color and texture; spandrels provide deep reveals that cast unique shadow lines mimicking the louver designs of the arcade walkway. The facility is one of the highest structures in the shopping center, with eye-catching, red clay tile-roofed towers that advertise retail opportunities and generate revenue. Three large, illuminated signs span multiple floors on three sides and offer additional advertising. The garage’s black-and-orange color palette mirrors that of adjacent overflow lots. The parking guidance system’s dynamic signage directs patrons to aisles with open spaces; static signage points to the exits. Climate-controlled, glass stair and elevator towers give users a preview of the complex upon arrival and provide comfortable, passive security. Elevator lobbies that open to the interior and LED lighting ensure full visibility across the garage to the vertical circulation.